The largest colorless diamond to be auctioned in 18 years will be offered May 28, according to a Christie’s Hong Kong press release. 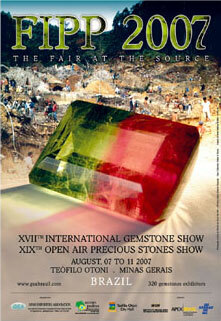 The poster for last year’s fair features a bi-color tourmaline. 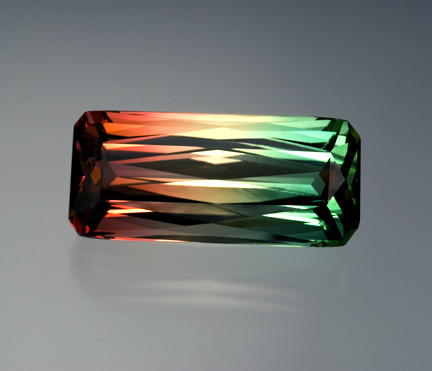 Brazil is a major source of tourmaline. It's not too early to plan for Brazil’s 18th annual gemstone show, Feira Internacional de Pedras Preciosas, better known as FIPP. The fair is held in the central plaza of the city of Teófilo Otoni, in the southeastern state of Minas Gerais. 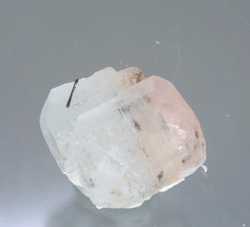 Teófilo Otoni is home to mines producing aquamarine, chrysoberyl, quartz varieties, and topaz. Ralph Esmerian, on behalf of Fred Leighton and seven affiliated companies, has filed for bankruptcy protection, effectively halting an attempt by Merrill Lynch to collect outstanding debts, according to Bloomberg, April 15. 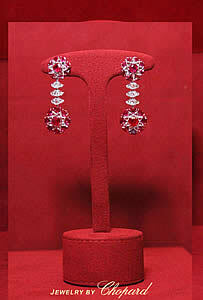 Christie’s was scheduled last Tuesday to auction an estimated $34 million worth of jewelry, according to the New York Times. This exquisite gem has a pure pink coloration that is even and consistent and has been awarded the color grade of “Fancy Intense Pink” by the Gemological Institute of America. 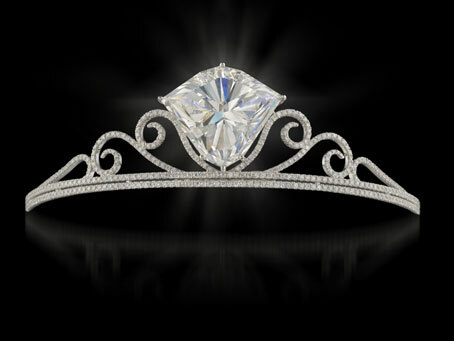 The diamond is truly magnificent for both its size and absence of inclusions within its crystal. Further emphasizing its rarity is the elegant and classic rectangular cut of the diamond which is so intensely saturated with color that no additional facets were required to intensify its tone. 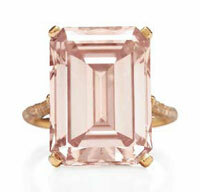 Unlike blue or yellow diamonds, the natural pink color is not caused by a chemical component. Although researchers disagree on what actually causes the color of natural pink diamonds, studies in the gemological field have concluded that there are two types of pink diamonds, each having a slightly different cause of color. 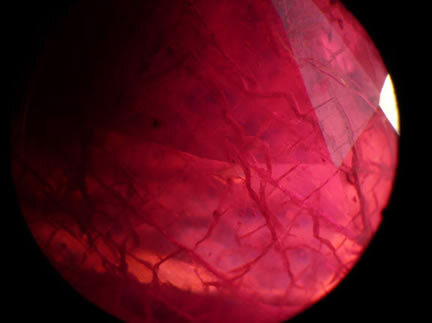 One group, designated Type IIa, has a very pure pink color, even coloration and lack of inclusions. 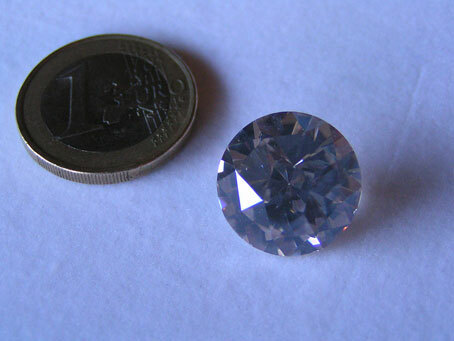 Type IIa diamonds are rare gems of the diamond family, which have no traces of the colorant nitrogen. The absence of this element, seen in 98% of diamonds, gives the stone a purity of color and degree of transparency that is observed only in the finest stones originating from the mines of Golconda, Brazil and South Africa. While not as spectacular as the Esmerian diamond, Sotheby’s April 10 Hong Kong sale featured three notable colored diamonds (requires free login). 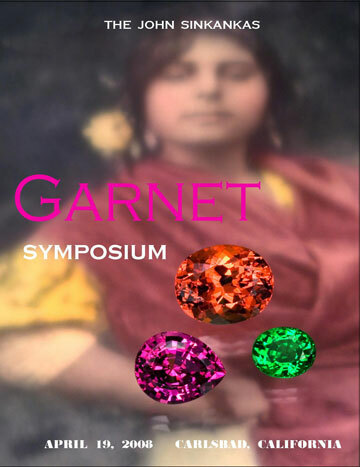 The sixth annual John Sinkankas Symposium was held over the weekend, on the topic of garnet. The event is co-sponsored by the San Diego Mineral and Gem Society and the GIA’s Liddicoat Gemological Library and Information Center. Pala’s Wimon Manorotkul provided photographs for this year’s symposium booklet. 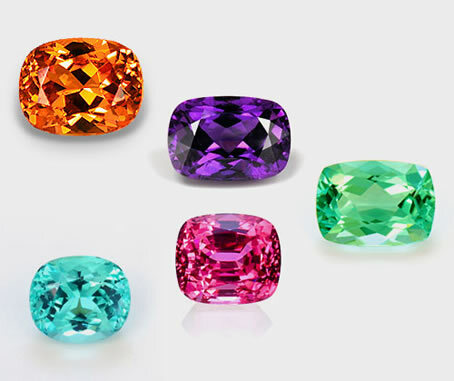 The gemstones are (l–r) rhodolite, spessartite, and tsavorite garnets. Speakers and topics were scheduled as follows. 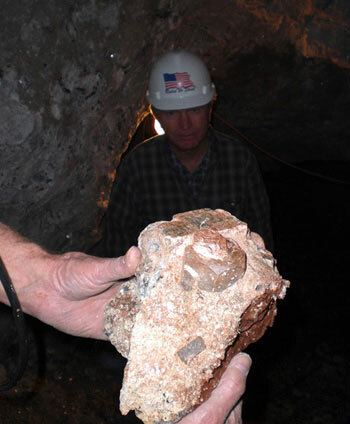 In February, we received a note about a remarkable scheelite mine in Salzburg, Austria. The note came from Dr. Gerhard Niedermayr, Emeritus Curator of Gems and Minerals at the Natural History Museum Vienna (home of the famous “Venus of Willendorf” statuette). According an article by Dr. Niedermayr in the June 2007 Gemmo News, of the Austrian Gemological Society, the crystal material is often found in relation to the useful element tungsten. The Salzburg scheelite deposit is very large and has yielded facetable material like that shown below. 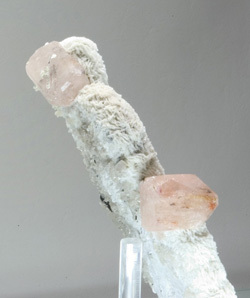 The crystal which yielded these new cut stones actually had been found by a miner [in] 1985 in a 20-x-30-cm. big alpine cleft in amphibolite, in the course of active mining operations. 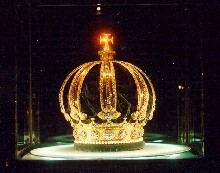 The original 2.6-kg. crystal was broken in many pieces by blasting. From these fragments, more than 20 years later, the gems had been cut. 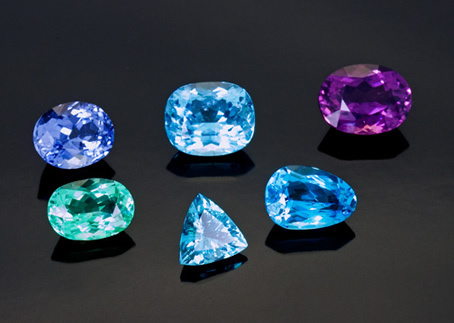 Some other remarkable stones weighed 169 ct., 130 ct., 118 ct., 70 ct., and 39ct. The teardrop shaped stone was by far the biggest one. Material is still available from Andreas Steiner. On February 1, just prior to the Tucson show, JCK’s Gary Roskin blogged [content removed] regarding relatively inexpensive sales of andesine-labradorite by Jewelry Television (JTV). 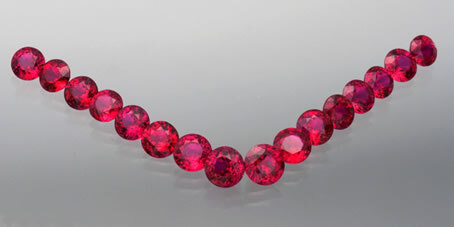 Sales of the gemstone were so brisk, JTV’s inventory was reduced “to a fraction of its original level,” according to JTV’s own blog entry [content removed] of January 31. The popular stone would be in short supply at Tucson. 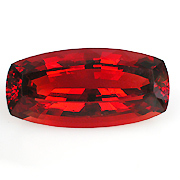 This 34.06-carat sunstone from China was acquired by Pala’s Bill Larson at the time of the ICA Congress in 2005. On March 5, Roskin blogged [content removed] that the JTV rough had been sent for testing to Drs. 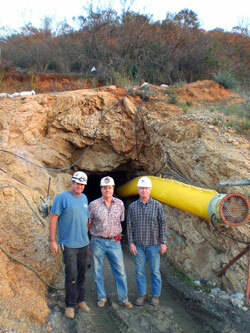 James Shigley (GIA), George Rossman (Caltech), and John Emmett (Crystal Chemistry). Roskin also speculated on the possibility of diffusion treatment and questioned the claims of “natural color” for material from other non-U.S. localities (Tibet, Congo, Central America). 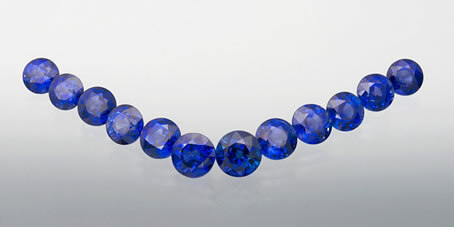 Tanzanite (aka zoisite) comes in a variety of hues, some rarer than others—from deep indigo to yellow-green to almost colorless. 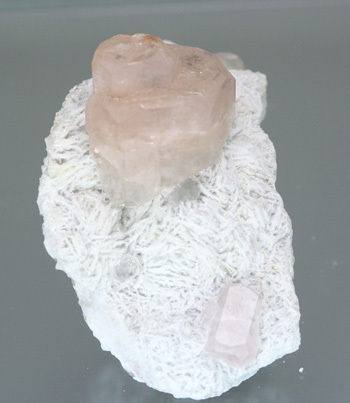 The material is mined exclusively in Merelani, Arusha, in northeastern Tanzania. 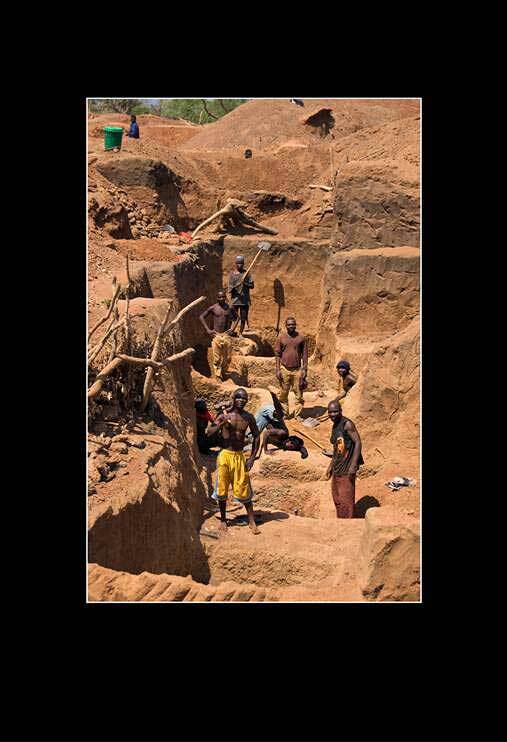 In late March, as many as 70 miners at a tanzanite mine in Merelani were trapped and killed following seven days of heavy rain, according to a statement by the charitable organization Oxfam Ireland. The statement says that a two-hour flash flood on March 29 “swept off the surrounding hills and through several villages in the Mirerani sub-district” and that hundreds of houses and latrines in nearby villages have been destroyed. Funds will be distributed in various ways focusing on immediate relief and assistance to the families that have been unfortunately affected, as well as future projects. Furthermore, strategies and infrastructure encompassing safety measures will be implemented in order to attempt to prevent such a tragedy from occurring again. For further information please contact Hayley Henning at the Tanzanite Foundation 212-575-3020 or hayley@tanzanitefoundation.org. While dramatic incidents like the present one in Merelani fortunately are not common in countries of the global south, the life of a miner is not easy. (Even in the U.S., coal mining continues to be one of a dozen relatively hazardous occupations.) Mining safety usually is balanced against other issues, such as attraction of foreign investment and a real need of workers for employment. 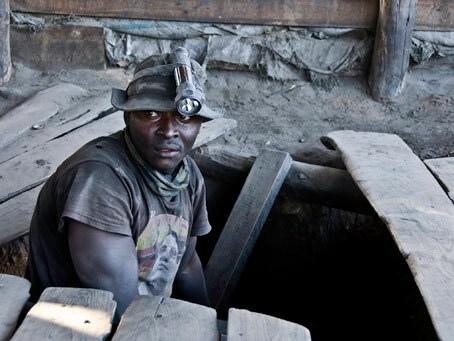 Entrepreneurs are capable, however, of a measured and humane approach to mining development, as demonstrated by mining operator Moussa Konate in Mozambique (see our February Gem News report), who appears to be placing sustainability before swift gain: he is focusing on community infrastructure as well as mechanization. Thus the good, the bad, and the ugly are woven into the backdrop behind the beautiful and exciting minerals and gemstones that take center stage. A February 20 item on the Yangon City website stated that “the export of gems and low-prize gems fetched over US $562 million from January to December, 2007, it was learnt.” The item announced the 45th Gems Emporium, which was held in March. The $562 million figure is consistent with the three $185 million dollar sales ($555 million total) reported or estimated for 2007. An April 8 Bangkok Post article echoed this report. This figure doesn’t seem to account for several interim sales held in December, August, and January, however. The 2007 calendar year total can be compared roughly with the fiscal year 4/06–3/07 total of $296.9 million—an increase of 89 percent. No sales figures have been issued for the 45th Annual Myama Gems Emporium, held March 9–20. An Agence France-Presse (AFP) article March 11, reported that $153 million (€100 million) worth of jade, gems, and pearls would be offered at the sale. This is considerably less than the €148 million worth offered at last year’s annual sale, although the lots offered are 7,700, compared with 6,000 a year ago. 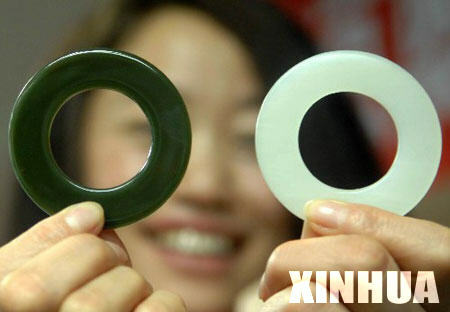 Pala has received personal communication Chinese buyers at the jadeite auctions account for more than 95% of the sales. No buyers from the U.S.A. were listed. AFP quoted an official as stating that the 7,123 jade lots offered this year were worth about €78 million. The official said this number of lots “is the largest quantity of jade compared to previous auctions.” A March 11 Rapaport story, attributed to Xinhua News Agency, echoed the jade lot figure as well as an offer of 300 lots of gems and 270 lots of pearls. In case you couldn’t make it to Tucson this year, Pala’s Jason Stephenson provides the following highlights. There weren’t necessarily any new varieties on display this year at Tucson, but there were definitely some new localities producing some of our old favorites. Tanzania has been a real hot spot for new gem deposits lately. The aftermath of the giant spinel crystal was scattered amongst a handful of dealers. These shocking neon spinels with mixtures of red, pink, and orange were unquestionably distinguishable from other localities by their unique hues. Some larger stones—8-ct.-plus—were available, but seem to have either some silk when pure color, or clean with a bit of brown. 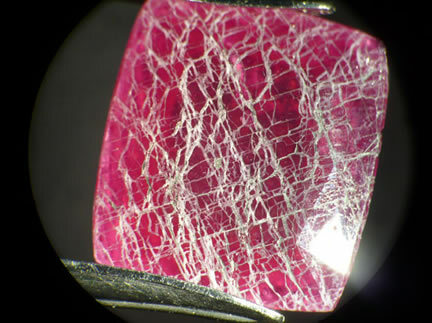 See our new Tanzanian spinels here. 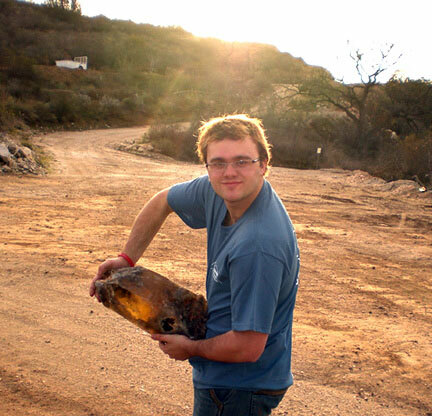 There was another new find in Loliando, Tanzania, of spessartite, which was recently dug between December ’07 and January ’08. Beautiful mandarin and pumpkin colors reminiscent of the Nigerian deposit. The larger stones unfortunately had some clarity issues but the smaller ones were bright and colorful. 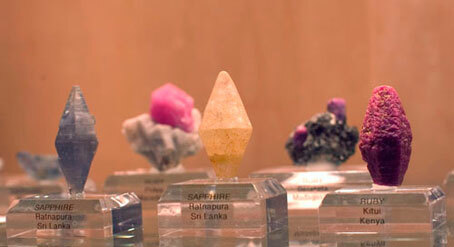 Along with cut gems there were some incredible crystals from marble size to baseball size. We have dozens of these gemstones available here. 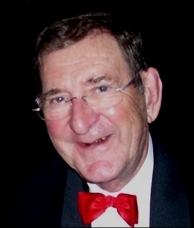 The Gemmological Association of Australia’s Dr. Grahame Brown died on January 15 in Brisbane after a struggle with cancer, according to the GAA website. 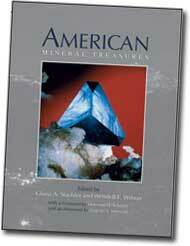 Brown was the longtime editor of the GAA journal, The Australian Gemmologist. We asked Richard Hughes for his thoughts about the life and death of Grahame Brown. Grahame Brown was one of our field’s most prolific writers. But more than that, he had an insatiable curiosity that manifested itself in everything he did. I first learned that Grahame was ill when I was in Tanzania in October. He sent an e-mail seeking information on a gemological subject and mentioned that he had been fighting a battle with cancer. This was not a good day. Just minutes before reading his message I learned that my hometown had been evacuated and was frantic as I could not reach my wife. Events such as these tend to focus the mind, driving home the clear distinctions between the meaningless and the meaningful. This was clearly something that Grahame understood. Having the pleasure of knowing Grahame Brown meant a lot to me. I learned so much from him. But never more than in the end. His actions taught me the importance of work, which is what remains when the flesh is gone. His work is our link to his spirit and his immortality. 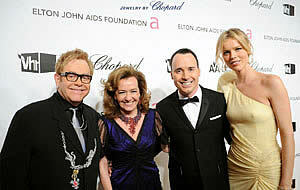 High fashion and fine gems studded the red carpet at this year’s Academy Awards on February 24. Penelope Cruz was wearing a spectacular pair of ruby and diamond earrings from Chopard with a total carat weight in ruby of 25 carats. An inexpensive, portable spectrometer taken “into the vault” has allowed for the spectral fingerprinting of 67 natural blue diamonds, including the two largest known: the Hope and Blue Heart. The Hope Diamond has long been known to glow red when exposed to ultraviolet (UV) light, a phenomenon thought to be quite rare; greenish-blue phosphorescence is more common. 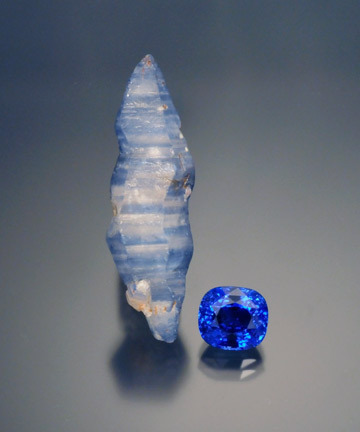 Researchers, including Jeffrey Post, curator of the Smithsonian’s National Gem and Mineral Collection, and Sally Eaton-Magaña, now technical editor of Gems & Gemology, found that “virtually all” blue diamonds phosphoresce orange-red (660 nm.). But this band usually is obscured by an accompanying green-blue (500 nm.) emission. 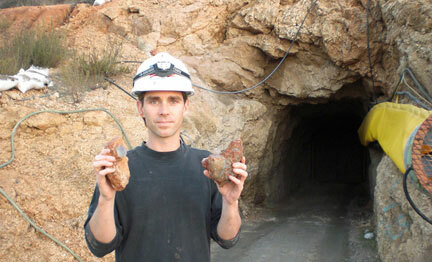 It’s the intensities of these two bands—unique to each stone and likely due to relative amounts of boron and nitrogen—that provide gemologists with the means of fingerprinting. The findings were first presented at the Gemological Research Conference of the Gemological Institute of America. 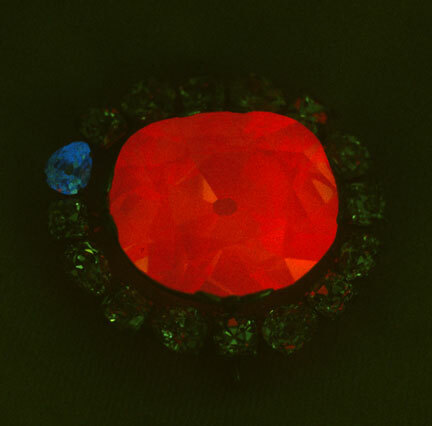 According to the abstract [PDF, 5.7 MB] of that presentation, the method employed—phosphorescence spectroscopy—is not often used in gemology, but it allowed them to test the stones at room temperature without fear of damaging the jewels, which happened to be on loan for exhibition at the Smithsonian. 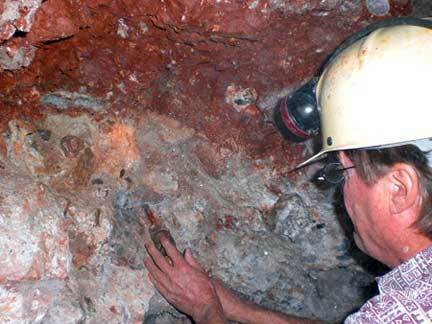 The research was published in January by the Geological Society of America. Also tested were treated and synthetic blue diamonds, which “showed behavior distinct from natural stones,” according to the article’s abstract. Once you’ve seen the Hope Diamond and the Carmen Lúcia Ruby at the Smithsonian’s National Museum of Natural History, you’ll want to head over to the American Art Museum’s Renwick Gallery. 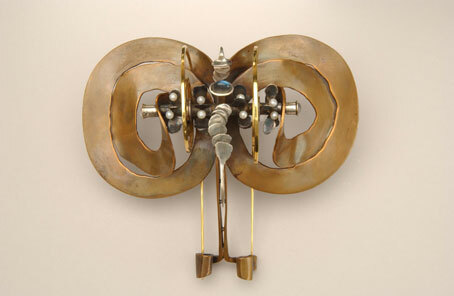 In “Ornament as Art” you’ll be hard-pressed to find actual gemstones or crystals, but the variety of 275 examples of “wearable art” could be worth the search. 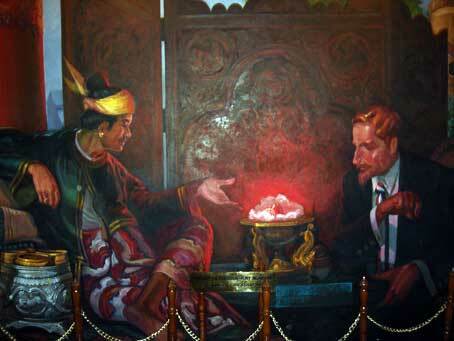 As we reported in December, the (legitimate) gem trade in Burma is dwarfed by oil and timber. The article puts the trade with China, Thailand, and India in electricity, natural gas, oil, and timber at $2 billion a year, compared with the reported $297 million in fiscal year 2006–07. The following statistics were included in a February 10 story by the official China Xinhua News Agency. Last month in Pala’s Mineral News, we profiled the photography of Bruno Cupillard, who creates works of art from painstaking shots of mineral specimens and gemstone inclusions. (Cupillard kicked off FotogFocus, our occasional series devoted to the work of gemstone and mineral photographers.) 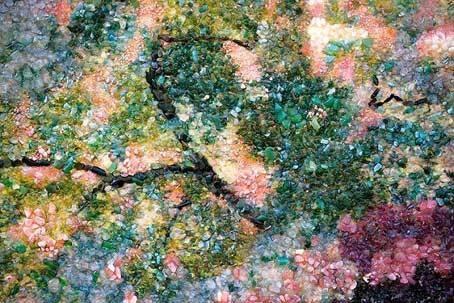 Another artist, Ilya Schar, uses gemstones as his medium, but in a different way: literally painting with the stones themselves. 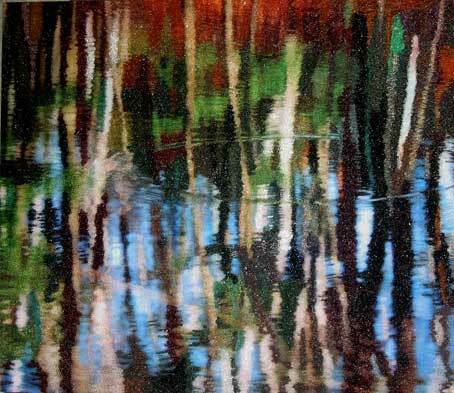 A native of Moscow, Schar now lives in Beverly Hills and devotes himself to his lifelong love of art and gemstones, following a career as an oral surgeon. According to his representative, Marina Deutschman, Shar crushes and polishes the stones by hand, and no paint at all is used in his work. The chapters bounce around the country like an enthusiastic collector seeking knowledge about the variety of deposits—from the remote epidote deposits in Alaska to the unusual zinc ore minerals of New Jersey, from the spectacular pegmatite minerals of San Diego County to the high-elevation aquamarine and rhodocrosite deposits of Colorado. From the shocking pyromorphite specimens of Idaho to the stunning crystallized gold from the foothills of the Sierra Nevadas. A total of 44 mineral-producing areas are highlighted in glorious detail. 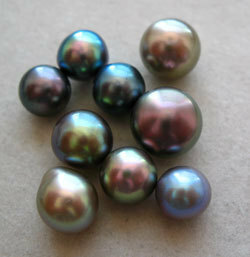 Last November, we called your attention to a pearl convention to be held that month in the United Arab Emirates. According to the First International Pearl Convention website, 120 delegates from over 30 pearling nations attended the conference, which was held in Abu Dhabi. The five-day convention included “ten technical seminars, a daylong summit, two study tours, and a host of networking opportunities.” The inspiration behind the event was a revitalization of what was once a thriving local trade until the early 20th century, according to officials who opened the convention. Haüyne. Huh? 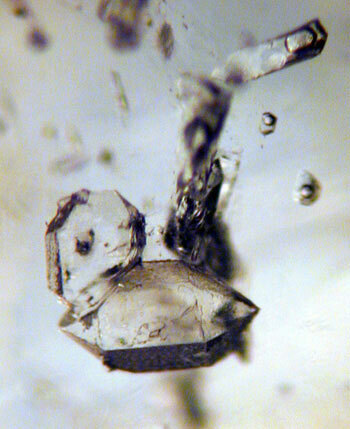 The origin of the name stems from the French pioneer in crystallography. René Just Haüy lived from 1743–1822 and is considered one of the founders of modern mineralogy. Haüyne is a member of the sodalite family, which also includes lazurite, hackmanite, and sodalite. These vivid neon blue haüynes were mined in Germany by some local collectors within the last couple of years. They are from a small quarry in the Mendig lava flow in Niedermendig, in the Eifel Mountains. 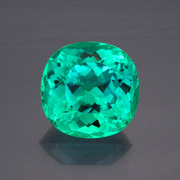 The color is reminiscent of a blue sapphire or a dark paraiba tourmaline. 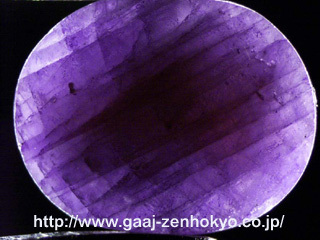 Also available is a 1.03-ct. oval (This stone has been sold.). Pala International President Bill Larson was elected to the Board of Directors of the American Gem Trade Association (AGTA), it was announced January 16. The term of office is three years. 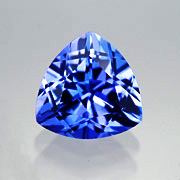 The Gemmological Association of All Japan Research Lab (GAAJ) has released a report on a technique of lead-glass filling, “coloured blue by mixing cobalt metal,” being used to treat pale-colored blue sapphire. The report, updated December 27, 2007, includes photographs and a radiograph, as well as diagrams of spectral and chemical composition analysis. 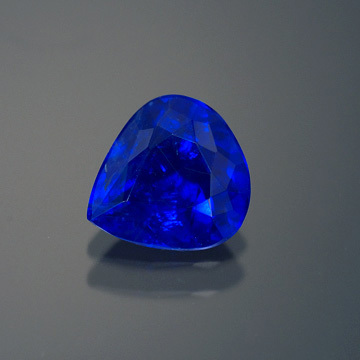 The GAAJ article references a corroborating report from October 2007 by The Gem and Jewelry Institute of Thailand Gem Testing Lab (GIT) entitled “New Blue Treated Sapphire.” The latter report concludes that the original sapphire material was “semi-translucent [and] pale colored” and contained numerous cracks. The material was heated at high temperature in a process “involving cobalt and lead containing flux.” The resultant color was achieved by the “cobalt-bearing solid residues” that remained in the healed fractures after treatment. A year ago, we profiled Moussa “Moses” Konate and his paraiba-type tourmaline mines, in “The Path to Paraiba Winds Through Mozambique.” This month, the GIA released a report on the deposits following a visit late last summer. 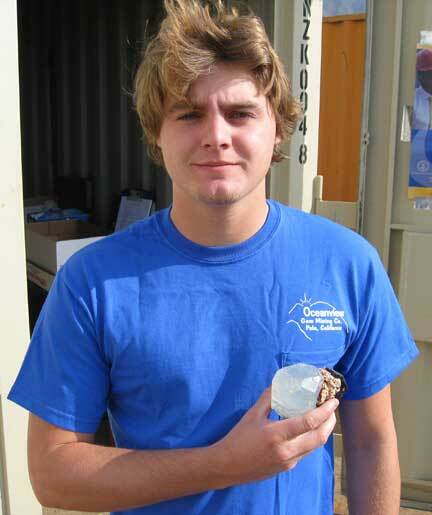 Gems & Gemology editor Brendan Laurs and Netherlands National Museum of Natural History researcher J. C. “Hanco” Zwaan. 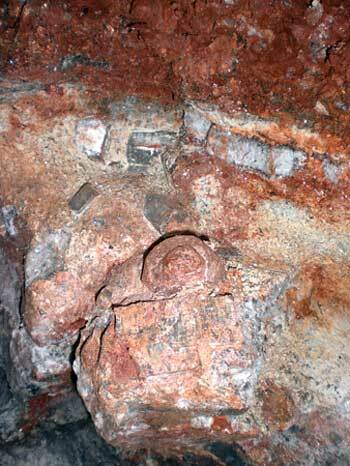 The report discusses the location, geology, and mining of copper-bearing tourmaline. As we reported last March, Konate had suspended operations in order to develop the local community infrastructure. The GIA report states that Konate and crew “had completed a comprehensive environmental impact report and performed systematic mapping and test pitting of their claim” in preparation for mechanization of the operation. They foresee completion of a 150–200-ton-per-day washing plant by mid-2008. These two items on the subject of irradiated topaz came across our desk over the last couple of months. Everyone seems to be upbeat about this year’s prospects. The 24th Gems & Jade Sales 2008 was held January 15–19 by Union of Myanmar Economic Holdings Ltd. (UMEHL), resulting in the sale of the following, according to the official New Light of Myanmar newspaper (Jan. 19 and Jan. 20). Mandalay gem traders have expressed concern to The Irrawaddy regarding relocation of the largest gem market, from Mandalay to Rangoon (Yangon). The January 21 story quotes dealer Than Tin: “The authorities want to move the Mandalay gem market to Rangoon because it would be easier to control and export large quantities of gems legally. … Everyone is disappointed.” The Irrawaddy claimed that the Mandalay gem and jade market “has slowed drastically” in light of the impending relocation. 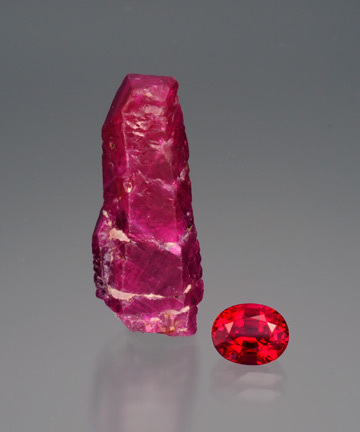 We stumbled across this item from 2004 that still might be of interest due to its mention of Mogok ruby. The article closes with a statement that deserves comment. 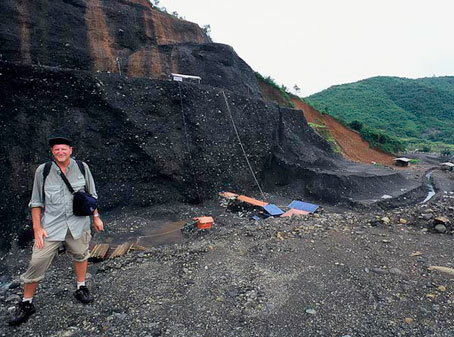 “Politics in Myanmar have long blocked scientists—especially Western scientists—from entering the country to take a look.” We mentioned this to ruby expert Richard W. Hughes, who had this reply: “The Burmese regard their gem resources as a strategic resource. They no more invite ‘Western scientists’ to poke around than we invite Saddam’s people to Las Alamos.” Think the Burmese are paranoid? Just ask the Bolivians, to whom it was revealed this month that Peace Corps volunteers and a Fulbright Scholar were asked by a U.S. Embassy official to spy on any Cubans or Venezuelans with whom they came into contact during their stay, as reported by ABC News among others. 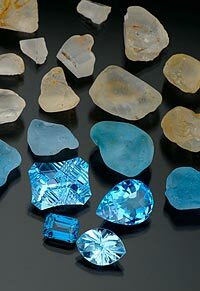 We’re pleased to reprint Robert Weldon’s article, “Topaz Blue & Déjà Vu,” courtesy of the Gemological Institute of America. Weldon neatly discusses the history and science of gemstone irradiation, up to the point of recent Nuclear Regulatory Comission actions. 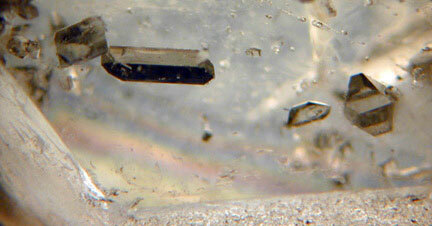 At right: Virtually colorless topaz rough (above) is irradiated and then heated to turn blue (middle layer of rough). 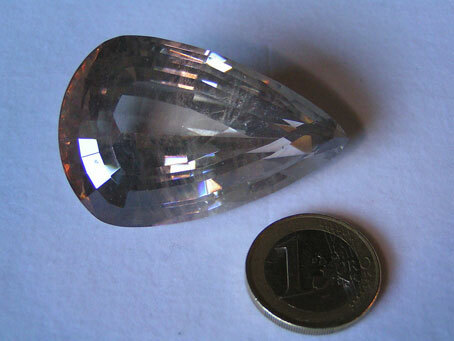 The NRC and experts today say that topaz should be faceted before it is irradiated so that cutters are not exposed to potentially harmful dust. 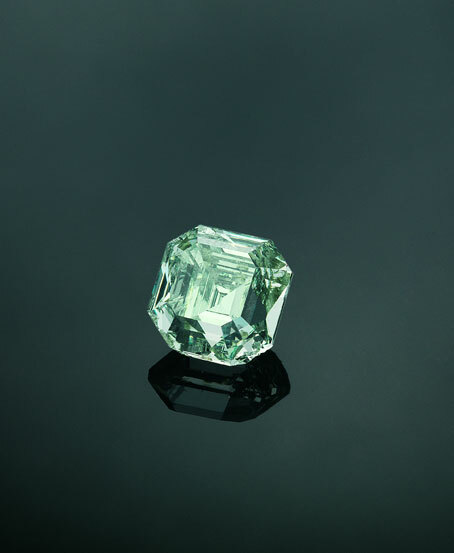 Rough in the range of 25 to 50 ct, faceted gems in the range of 32.72 ct to 7.12 ct. Photo by Robert Weldon, © 2007 Gemological Institute of America. 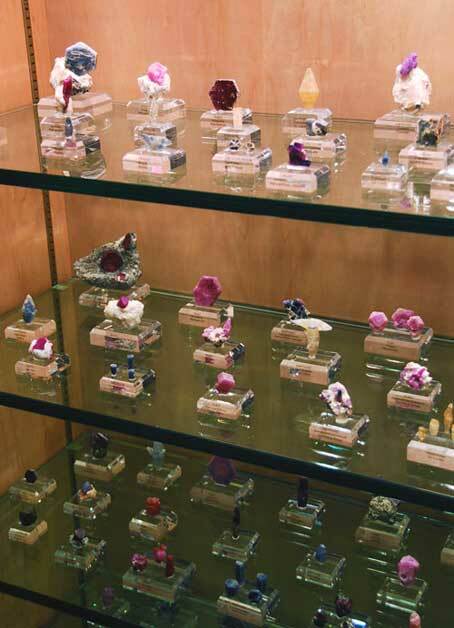 Make your plans for the world’s greatest gem and mineral show in February. 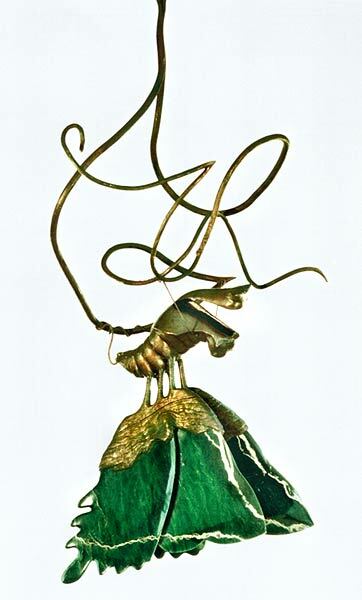 Friends of Jade presents its second annual exhibition of contemporary jade sculpture and jewelry, concurrent with the other major Tucson shows next month. 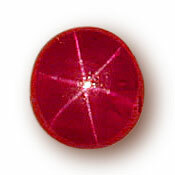 See also last month’s article on lead-glass filled rubies. Olympic medals presented at the 2008 Olympic Games in Beijing will incorporate jade from the province of Qinghai, on the northeastern area of the Tibetan Plateau, in western central China, according to a January 1 story from the official Xinhua News Agency. This is the first time that non-metal materials will be used in such medals, according to Xinhua, but one of our readers recalls lead crystal or polished glass being incorporated into the medals presented at the 1992 Winter Olympics in Albertville, France. 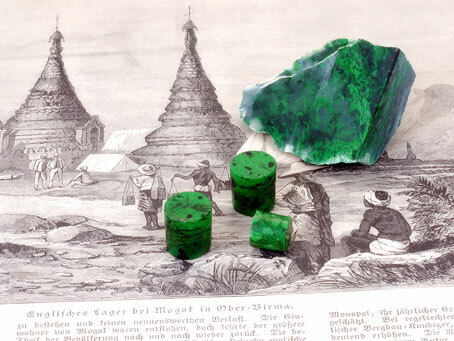 “Qinghai has abundant reserve of jade. We will select the best manufacturer to ensure the quality,” he added. A Friends of Jade article on the medals questioned whether the 6,000 medals required would employ Chinese jade exclusively. Friends of Jade also has articles on Ge’ermu jade (such as this one). Last fall, JCKonline articles by Gary Roskin carried two remarks by Dr. Andrew Karam, of Rochester Institute of Technology, regarding the safety of irradiated topaz. Dr. Karam has worked as a radiation safety consultant as part of the Nuclear Regulatory Commission’s (NRC) recent efforts to address the irradiation issue. In response to a September 11 story on the subject, Dr. Karam posted the following. We’re reassured by NRC regulatory action and likewise by Dr. Karam’s remarks. But, of course, NRC statutes and an expert’s dosage estimates don’t address (and plainly aren’t meant to address) the issue of worker safety abroad—during the handling, cutting, and polishing of irradiated material. We’ve come a long way in thirteen months. But we can’t ignore the fact that the conversation remains open, dangling. The Myanmar Times article also refers to an unnumbered sale held by UMEHL that ended December 13, the results of which were not available. The 45th Myanma Gems Emporium 2008 is scheduled to be held in March, according to a January 11 article in the official daily, New Light of Myanmar. No other noteworthy details were included in in the article. The Myanmar Times article cited above includes a $185 million sales figure for the November 2007 gem emporium—$35 million more than the weekly had reported early last month—based on “independent estimates.” The decline of the US dollar against the euro probably doesn’t explain the discrepancy, but exchange rate confusion might underlie figures that were reported before and after the sale. On November 19, while the sale was underway, The Myanmar Times reported floor prices of $300 million (without citing a euro figure). But to muddy the waters, the article claimed that €130 million of the total was for two jade blocks. If the exchange rate on November 19 was €1.4658 to the dollar, €130 million would have equaled $190 million, nearly $30 million more than the $162.5 million ($100 + $62.5 million) quoted in the same article. In any case, two jade-block whoppers were on offer in November. The day after the sale ended, another AFP article speculated that the more expensive of the two may actually have sold. 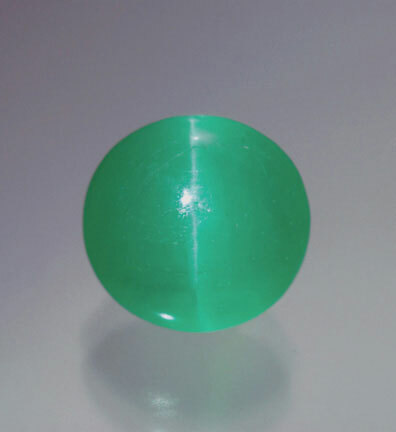 The [New Light of Myanmar] newspaper did not say whether that pricey green stone was sold during the auction, but noted the military government “honoured” the highest bidder of jade lots without giving further details. Well...honoring the highest bidder is a tradition at the conclusion of the sales, so AFP appears to be fishing on this one. 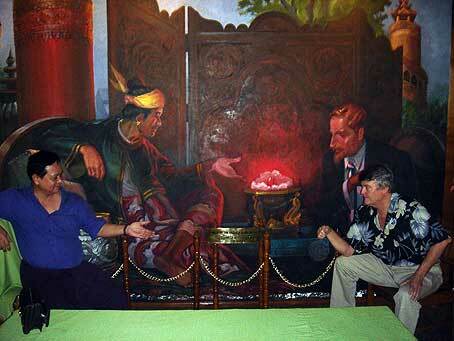 And it’s questionable whether the sale of either of the two high-priced jade lots could have been kept under wraps. Even if they had, it likely would have pushed the November sale’s total over $200 million instead of the $185 million most recently reported. For the record, we’re using the Myanmar Times “independent estimate” of $185 million on our Burma Gem Sales and Statistics. Figures for the first three quarters of fiscal year 2007–08 show that bilateral trade with China was $1.435 billion, up nearly 38 percent over the same period last year, according to the Chinese Embassy in Burma, as reported by the Chinese government’s Xinhua News Agency on December 9. 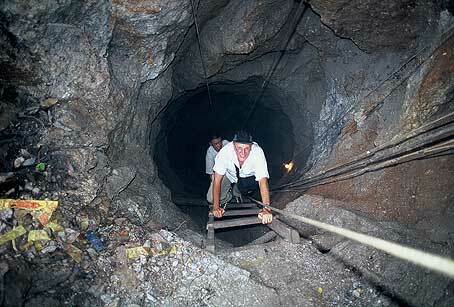 Workers in Burma find ways of making a living as mining operations close or relocate.